To cut a long and rather boring story short, for the next few weeks Lucy is going to nursery on a Monday meaning I get a day a week with Ella by herself. This Monday was our first day together. After dropping Lucy off, we got home to greet the builders and to see the skip being delivered. Along with next door, we are squaring off the back of the house as it’s currently ‘L’ shaped. Next doors is slightly more ambitious than ours (large kitchen/diner) but we will end up with a utility and a downstairs toilet when it’s all finished. Ella’s enjoyed waving to the builders from the window and watching them dig, lay bricks and pour concrete. I’ve not known an activity hold Ella’s attention for so long, or keep her so quiet. And not having Lucy, I didn’t know what to do with myself! So I got a cup of tea and sat and watched her. She did ask me to join in and draw a face, but for the most part she was happy drawing by herself. I noticed she has moved away from simple mark making to more of a colouring in action with some circles and other shapes – not just straight lines. The way she holds the crayon is getting better too, using her fingers rather than her palm. She’s getting good with her colours now, as she named the colours of the crayons she was using (I had no idea she knew ‘brown’!). After lunch, we headed to The Lowry at Salford Quays. 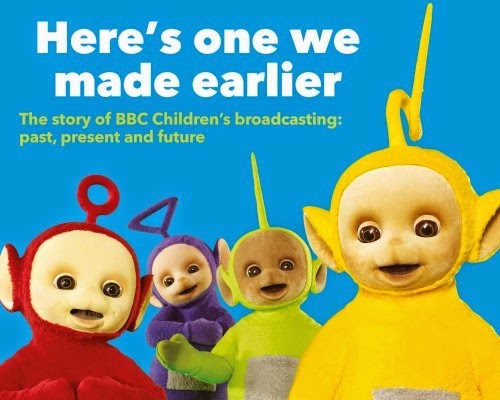 Our destination was the ‘Here’s one we made earlier’ exhibition, all about the history (and future) of childrens’ television broadcasting. We both had a great time, Ella spent ages reading books and playing with the soft toys in the ‘CBeebies’ window, she shook hands with a teletubby, met Gordon the Gopher, Morph, The Clangers and Bagpuss too! She enjoyed running through the exhibition space, which was fine as it was relatively quiet now it’s term time. It was good to be able to let her loose and have a bit of freedom – you forget how much easier just having one child is! After the exhibition we went for a stroll through the shops and I treated Ella to a chocolate babyccino from Costa. She helped to eat my cake too! It was then time to collect Lucy, who had also had an exciting and fun-filled day with her friends.